Cover is Arches Aquarelle with watercolor wash, edges colored with marker. Text is written out in Higgins Eternal and Rotring Artists Color. Folios are sewn into the folds. 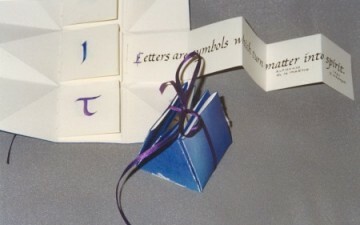 The books folds into a purse-shaped book as shown above. Book 2" (5cm) high, wide & deep when folded.